Prosecution considers closing cases against youth who live on hilltop outposts in Judea and Samaria, as senior officials plan to meet them. The Ministry of Justice on Monday held for the first time a special session on the so-called “hilltop youth” of Judea and Samaria. The session dealt with, among things, educational challenges, criminal and administrative enforcement, prevention of criminal activity, and enlisting the youth to serve in the IDF. The event saw the participation of Deputy Attorney General Raz Nizri, Chairman of the Ministry of Justice Ami Palmor, Director of the Pardons Department Nohi Politis, Head of the Binyamin Regional Council Avi Roeh, Head of the Beit El Council Shai Elon, Head of the Education Department in Beit El Menachem Lev, and Commander of the Recruitment Office Yossi Matsliah. The event took place following a visit organized by Palmor and Nizri to the local council of Beit El. 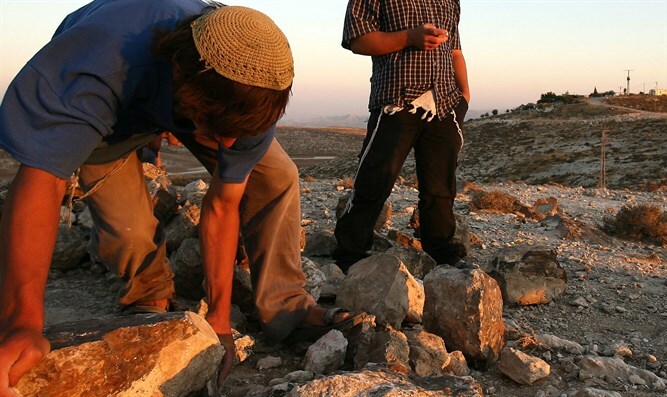 Arutz Sheva has information that the prosecution is considering closing criminal cases opened against the youngsters, and senior officials in the Justice Ministry are planning to meet with “hilltop youth” in order to create a dialogue. Justice Minister Ayelet Shaked has been working for an extended period to create such dialogue between prosecution and enforcement authorities and hilltop youth. Today, the hilltop youth feel a lack of trust for the authorities; and as such, Minister Shaked established a staff which is to focus on the youth, with the goal of building trust for the authorities and educational activity to minimize youth criminal activity. Likewise, the ministry will work to help the teens with personal problems under the assumption that personal and legal challenges lead to part of the offenses. Officials in the settlement movement and the Justice Ministry say that the hilltop youth must be related to in the same way that any at-risk youth are related to, without increased and more severe enforcement just because these youth live in Judea and Samaria. How will you accomplish this? we asked the officials. “With wisdom and sensitivity, with a lot of concern and fair treatment for the hilltop youth,” they said.